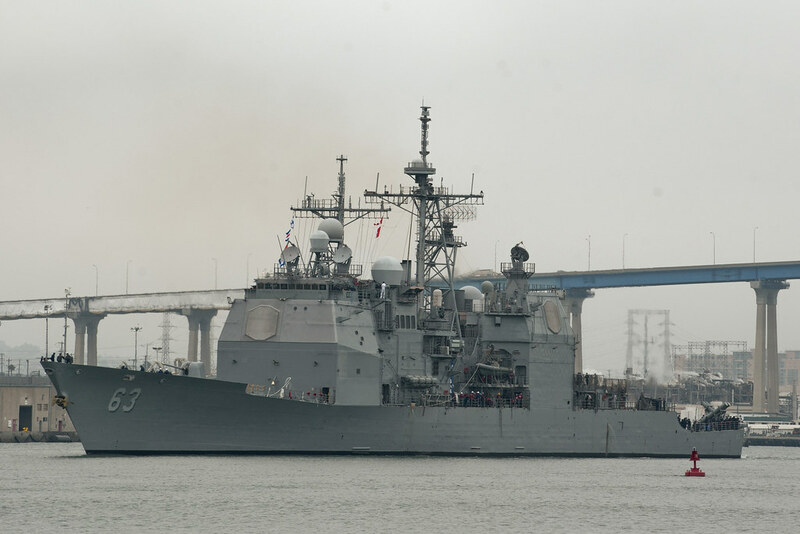 WATERS TO THE WEST OF THE KOREAN PENINSULA - The guided-missile cruiser USS Cowpens (CG 63) responded to a distress call and rescued two injured civilian mariners off the southwest coast of the Republic of Korea, Oct. 8. At approximately 5:20 p.m. (local), Cowpens received a distress call from a Cypriot flagged civilian container vessel, Hanjin Kao Hsiung, and responded immediately to assess the situation by launching its helicopter, the Red Stingers of Helicopter Anti-Submarine Squadron Light (HSL) 49, Det. 6. Upon arrival, the helicopter aircrew reported that two civilian mariners received third-degree burns to their hands and face from a fire on board. After coordination with USS George Washington's senior medical officer, it was decided to medevac the injured mariners to medical facilities ashore. The civilian mariners received immediate medical treatment from Cowpens' personnel and then proceeded to Kunsan Air Base where the mariners were turned over to shore based medical providers for further medical treatment. "I'm extremely proud of the entire team," said Capt. Gregory W. Gombert, commanding officer of Cowpens. "A lot of coordination took place in a short amount of time and it was done expeditiously and in a very professional manner. Assisting distressed mariners is almost second nature for us. We constantly train and maintain our readiness whenever the call is needed." Cowpens is on patrol with Commander Task Force 70, the George Washington Strike Group in the 7th Fleet area of operations promoting maritime security in the Indo-Asia-Pacific region.